It is difficult to picture the symbols of Athena without noting her constant avian companion the Athene noctua, or Little Owl. 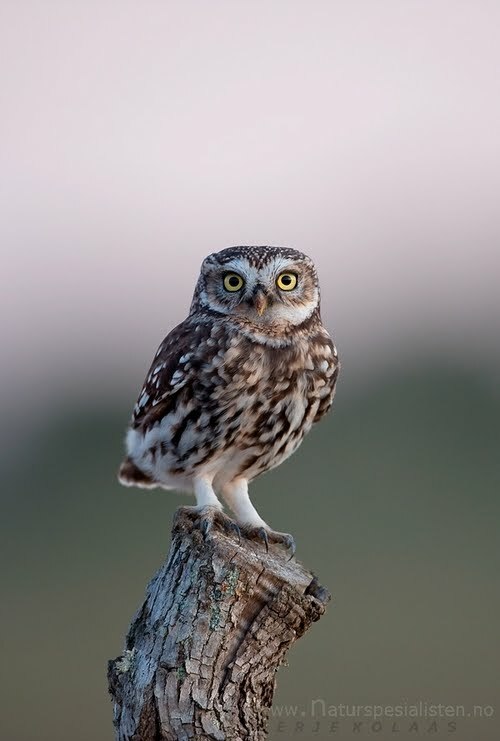 The Little Owl is sometimes seen as an aspect of Athena herself, and historians relate how Greek generals would keep a tame owl to release amid a heated battle in order to encourage his troops that Athena was with them. 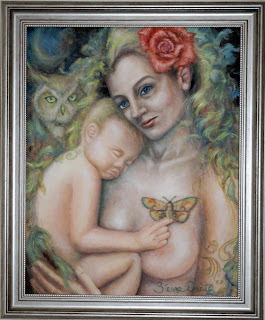 In western culture the owl is interpreted as a symbol of wisdom. Scholars debate if this is due to the owl's fixed human-like gaze, or its ancient associations with Athena. But, which came first, the owl-as-wisdom-goddess or Athena herself, who came to be associated with owls? 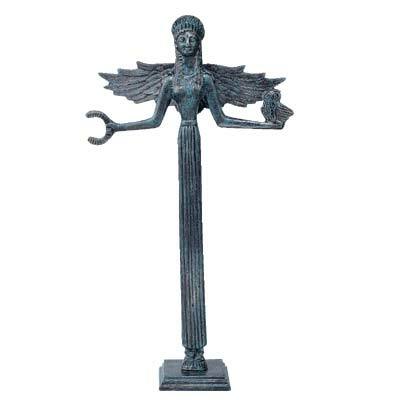 Goddess figures with characteristics similar to Athena have existed since before recorded history. 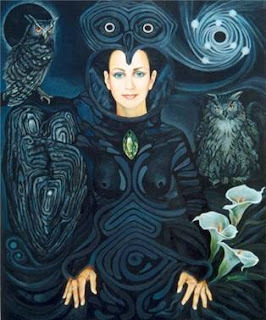 Marija Gimbutas traces veneration of the owl as a goddess, among other birds, to the culture of the Pre Indo-Europeans (PIE). From Sumeria comes the Burney Relief, dated around 1750 BCE, depicting a helmeted Goddess flanked by owls. Unfortunately, we can only guess at the significance of these icons, and cannot therefore conclude that they have any direct association to a Goddess of Wisdom. 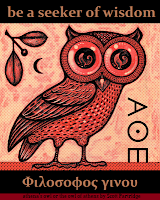 So how did Athena become associated with the Little Owl? One clue lies in the ancient proverb "bringing owls to Athens". Although many scholars state that the "owls" of Athens were its famous tetradrachms. These silver coins depicted Athena's profile of the face, and her Little Owl with an olive branch on the reverse. Presumably, because Athens minted these coins themselves, there was little need to bring more silver to the city. A more ancient interpretation of the proverb points to the significance of the first Parthenon, built by Xerxes I. One of the noted features of this early temple to Athena were its lofty rafters. In these rafters nested many generations of Athene noctua. The Athenians took this as a sign that Athena was present in the temple, and the birds were welcome there. Therefore, it was foolish to "bring owls to Athens", as they were already famous for their flock on the Acropolis. 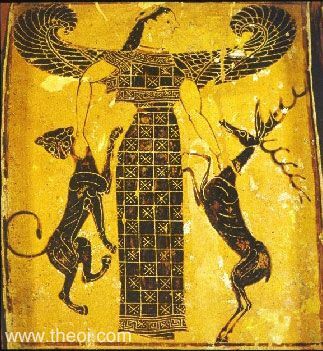 Did the owls of the Parthenon influence the symbolism of Athena so much that she became forever associated with the Little Owl, or was the association already present before the building of the old Parthenon, so that the birds were simply seen as Athena's blessing? Could it be a bit of both? One of Athena's most famous epitaphs is Athena Glaukopis, which is gleaming, silver, or gray-eyed Athena. Glaux itself means owl, so that even her name "A-Thea-na Glaux-Kopis" can be read "Holy Lady with Owl Eyes". 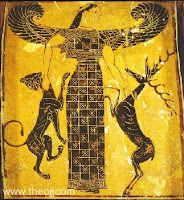 Very early images of Athena sometimes depict her with bird wings in the place of the Aegis. 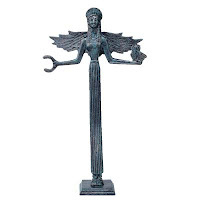 Nike, often called Athena Nike, another of Athena's epitaphs, retained her wings into recorded history. Could these wings point to an early connection to the owl? Are they vestiges of the PIE owl Goddess? "The large eyes of the Gorgon, as well as Athena's flashing eyes, are a symbol Gimbutas termed "the divine eyes", appearing also in Athena's bird, the owl. They can be represented by spirals, wheels, concentric circles, and other ways. They radiate the sun's rays and weep the spring rains. Snakes also possess the eyes. The fangs of the gorgoneion are snakes' fangs. Snakes are a symbol of propitiation and increase. The round face is the moon. Sometimes gorgoneia are endowed with birds' feet or bee wings, more symbols of regeneration. The mouth is open so that streams may flow from it. The lolling tongue is a symbol of death. It cannot be said that these motifs belong exclusively to the European Neolithic and not to the Indo-Europeans. They appear among the Celts and Germans] as well. The Balts kept snakes as household pets. As Gimbutas points out, masks with staring eyes are portrayed in Paleolithic cave art. 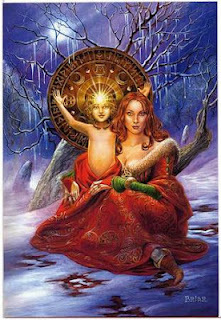 Very likely, the goddess precedes any Indo-European/non-Indo-European distinction." 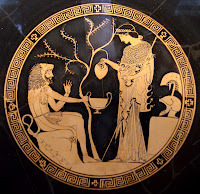 Owl eyes, snakes, (as on the Aegis and found throughout PIE art) bees, fresh streams of water, the moon, the labrys, the olive tree... Athena's ancient symbols are varied and point to a strong connection to an indigenous PIE Goddess figure. June has been a rewarding but exhausting month. I've been ill twice, and now that I am well I find myself combating a bout of depression. Meh. For the fifth year in a row I've helped put on the Babalon Rising Festival, and, as always, I come away from it not know what to say about it. The event is excellent, even if I am blowing by own trumpet, and it gets bigger and more powerful every year. 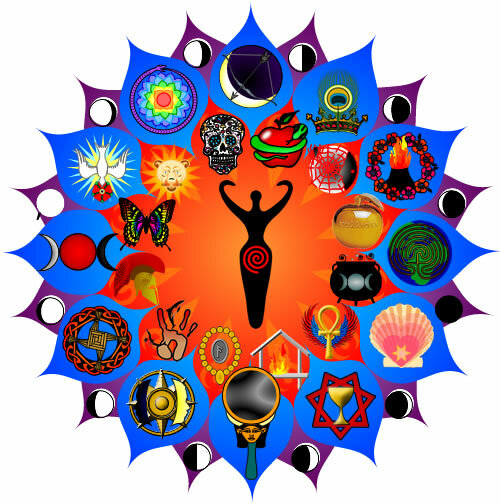 Babalon Rising is a festival primarily for Thelemites, although we have a large NeoPagan and New Orleans Voodoo component. The festival itself is designed to be a continuous four-day ritual, with its climax on Saturday night during an event we've named The Feast of the Beast. We've been working the festival annually as a trip up the Tree of Life, which made this our Tiphereth year. Accordingly, the sun came out in full force, and I spent much of the event with heat exhaustion. Good things prevailed, however. I assisted in facilitating a Qadishti sacred touch event, and served as one of the multiple women who invoked Babalon during the climatic ritual. I helped run, and eventually took over, our annual Kabbalah Bar event, which involves providing sepherotic themed body shots off of a living Tree of Life. The gifted and delightful Louis Martine led a wonderful ritual to help clear the Gulf of oil. I don't think I've ever heard a better drum circle than we had Saturday night. I love Babalon Rising, but it is like my child who has grown and moved on to things I never knew it could be. 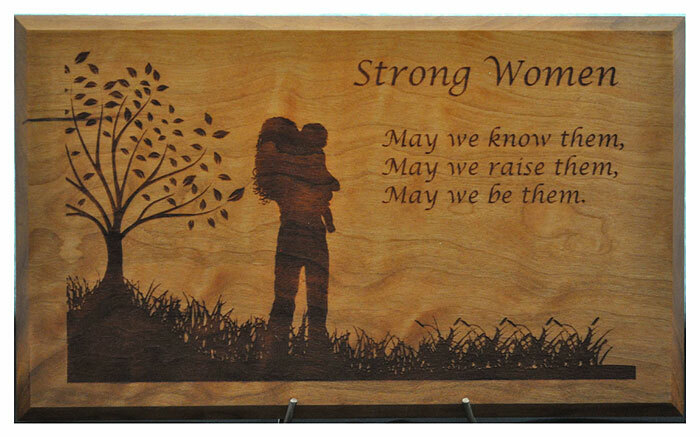 I consider myself lucky to be its parent, and ready to support it in whatever way it needs me each year. But it does not nurture me. The magic it represents is in a place that I like to visit sometimes, but I do not live there anymore. I've become more solitary, and maybe even a little jaded in my own approach to magic. I'll always be a witch at heart, but I'm in a place right now where serving the Gods interests me far more than rituals, potions, and pretty magic. My sense of wonder rests firmly with the Gods these days, and less and less with my own Will or ego. This has less to do with personal growth, I think, than with sheer exhaustion. I am no longer the Mage in her circle commanding the universe to bend. I am trying harder to bend with the universe. I helped Laurelei with an Aphrodisia ritual during the festival, and it was lovely. I find much that is beautiful and comforting to my spirit in Greek ritual and myth. I was the hydrophoros for the pompe, carrying my beloved Goddess amphora. 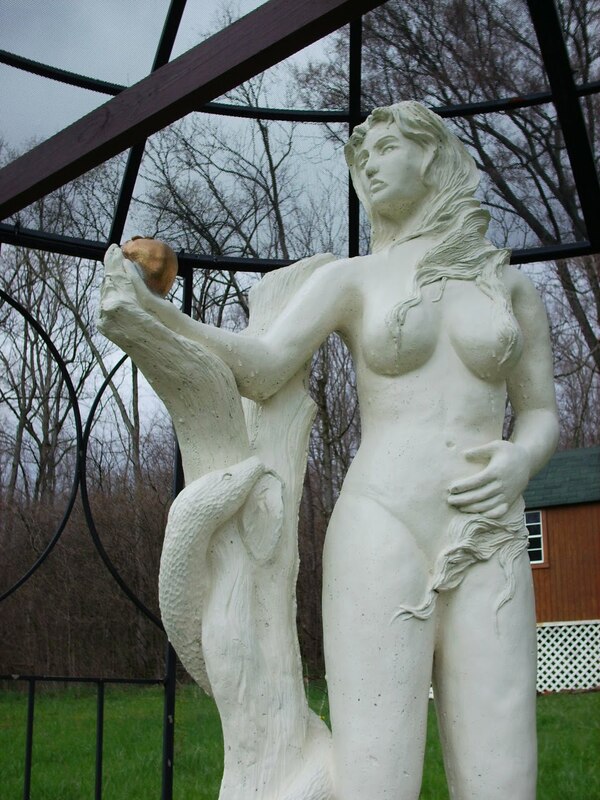 Laurelei established a stunning shrine to Aphrodite on the Our Haven grounds and we held the ritual there. The Arrephoria happened in June. 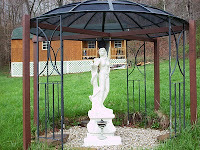 It is one of Athena's most important festivals, and is usually a big deal in our household as it combines mysteries of both Athena and Aphrodite. Alas, I was very ill during the Arrephoria, and did little more than burn some incense in tribute this year. Athena understands my lack of observance, of course, but I've been internally berating myself over it all month. The whole truth is that I've been internally berating myself about everything this month. I've entered a depression, which is a classic and expected component of my being Bipolar I. My medicines do an excellent job of keeping me in a sane and acceptable middle range of mood and productivity, but even they cannot keep me from dipping a little low or flying a little too high ever now and again. Depression for me is a lack of creative flow, a general sense of impending dread, and an urge to sleep around eighteen hours a day. You can see why I haven't blogged much this month. I haven't touched my manuscript either, nor my paints, nor yarn. Athena is understanding. Look at the famous relief "Athena Mourning" and you can see that sometimes her heart hangs heavy as well. I've been looking forward to Plynteria for weeks! Plynteria, along with Kallynteria, are Athenian festivals of purification associated with Athena. The Kallynteria was celebrated on Thargelion 25, which is June 6-7. Kallynteria is the "festival of sweeping". It was a thorough cleaning of Athena's temple by women under the direction of Athena's priestess. The priestess also refills and relights Athena’s eternal flame in the temple. 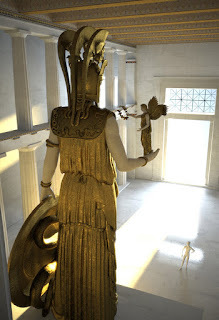 Kallynteria is an excellent day to refresh your Athena shrine or just erect one. Kallynteria is followed by Plynteria, the "festival of washing". During Plynteria the cult icon of Athena was divested of its peplos and veiled. The icon was then carried by women in a pompe to the ocean where it was ritually bathed. The pompe was led by a woman carrying a basket of figs. Two girls, the Loutride, or bathers, washed the icon in salt water. In the evening the icon was returned to the temple in a torchlight procession and was re-clothed in her peplos. Only the Loutrides and the women who dress and undress the Goddess are permitted to see Her naked. The ancient statue of Athena Polis at Athens was of human size or less, carved of olive wood, and probably showed the Goddess seated without weapons. 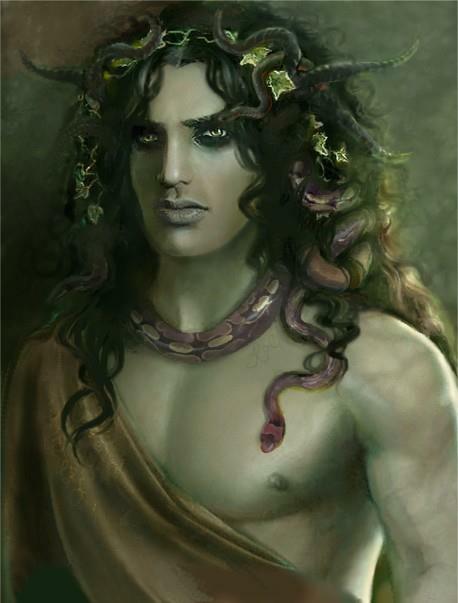 She wore a tall, golden stephane (crown) and She may have had a Gorgoneion (Medusa head) on her breast. Plynteria was a time that was considered apophras, or unfortunate, because the icon of Athena Polis was not guarding the city. 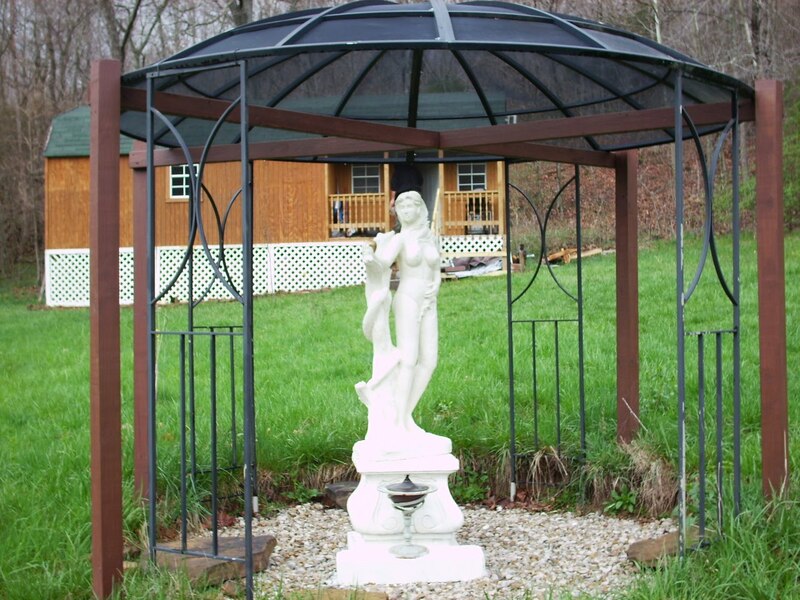 Tomorrow I'll be veiling my own icon of Athena and escorting her down to the pond where I will ritually bathe Her. After the bathing I will clean and rearrange my shrine to Her, light an oil lamp to symbolize Her eternal flame, and return the icon to its place on the shrine. Here are some links for further information on Kallynteria and Plynteria. and suggests that I take her. she makes eyes at the ladies. Anacreon was a mid-sixth century Greek poet from the island of Teos. He is noted for writing almost exclusively about the pleasures of life, love, wine, and banquets. I am flummoxed that even when faced with poetry fragments like the one above some people continue to doubt that lesbianism was known and practiced among the ancient Greeks. 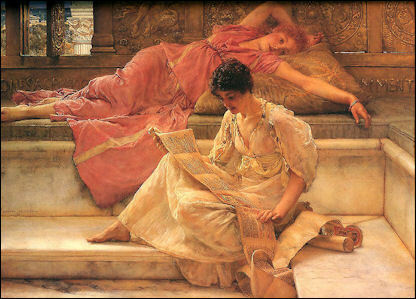 Even if you choose to read Sappho's heady verses inspired by young women as romantic friendship rather than frankly sexually charge poetry, you cannot deny that Anacreon understood lesbianism and even associated it with the isle of Lesbos. The Spring 2010 edition of Neokoroi's quarterly publication He Epistole has just been released. 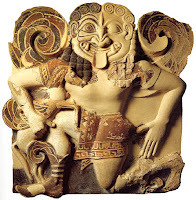 It contains an excellent article on Demeter Erinys by Suz Thackston and many other goodies. Many thanks to the He Epistole team for another excellent issue! And then there are the roughly 150 Delphic Maxims, most of which are reasonable, some of which are excellent, and a couple of which are patently ridiculous in modern society. I think of Xenia as being a part of Kharis, and, as a Hellenic Polytheist rather than a reconstructionist, I hold no truck with Nomos Arkhaios. Rather, I value Thelema, which can be viewed as an outgrowth of Arete, but it has been so central to my own spiritual development that I've given it a pillar of its own. I believe that most of the Delphic Maxims can be sorted into one of these categories, and I'm pretty comfortable with holding myself to these standards. 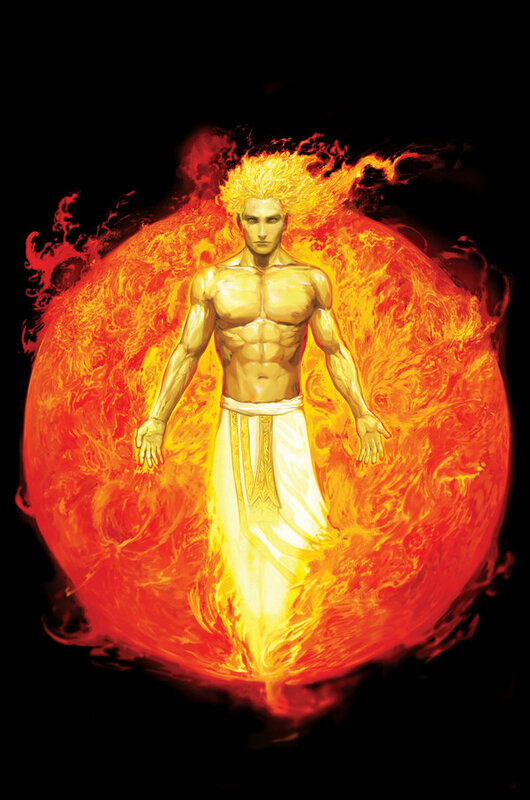 The festival of Mounukhia is concurrent with Beltane this year (May 1, Mounkhion 16, near the full moon) and I will be up to my knees in mud at a pagan festival, so I thought I'd go ahead and share some information about Mounukhia a few days early. The Mounukhia festival honors Artemis as her titles Potnia Theron (the Mistress of Beasts) and Artemis Fosforos (Artemis the Light-Bringer). It begins with a pompe in which the people carry round cakes in which small torches, or dadia, are stuck. These cakes are called amphiphontes (round-shining). They are offered to Artemis in thanks for the lives of beasts that were killed during the hunt, and for the light of the moon. Cupcakes studded with birthday candles make a simple and thoughtful substitute. Mousa, sing of Artemis, sister of Hekatos (the far-shooter), Parthenos Iokheaira (the virgin who delights in arrows), who was fostered with Apollon. She waters her horses from Meles [a river in Lydia] deep in reeds, and swifty drives her all-golden chariot through Smyrna to vine-clad Klaros where Apollon Argyrotoxos (god of the silver bow), sits waiting for Hekatebolon Iokheaira (far-shooting delighter in arrows). Only the 'bright-eyed intelligence' capable of discerning the decisive element at every juncture and of supplying the most effective instrumentality is an adequate characterization of her ideal . Consummation, the immediate present, action here and now - that is Athena. 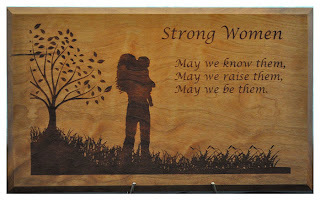 She is spirited immediacy, redeeming spiritual presence, swift action. She is the 'ever-near'. Athena stands behind Her favorite heroes and invisibly whispers advice, reason, and wisdom. 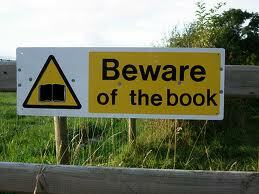 Although it is a modern epithet it is a telling one. Athena is often overlooked by those who seek Her because She is already so ingrained in our lives. I read a plea on a board tonight from a woman who offers Athena prayers, incense, and olive oil, but is left cold in her quest to find Athena. Athena is a remarkable theoi. 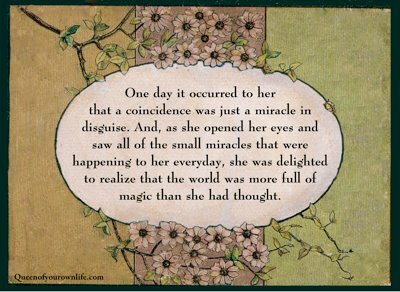 She is found in every rational action, every skillful movement, every whisper of wisdom in our minds. She is the soft voice just behind you urging you to speak out, to learn, to try again. Yes, there are times, rare and unbidden, where She reveals Herself to us in an omen, a shiver, a gleam of silver light. She may come to us in dreams, dazzling in Her finely woven raiment and polished bronze armor. We may hear Her clear strong voice, or be blessed with an inward vision of Her unspeakably marvelous eyes. But this is not how She usually comes. Athena feels like the solemn peace of the gray fog of morning spreading its dew on all living things. She sounds like the perfect bon-mot falling from your mouth. She is the right book that you just happen to read at the perfect time. She is the meditative state that accompanies the creation of any art. It is good to seek Athena, but it is better to know that She is already with you. She is truly the ever near goddess. Really, this is bloody brilliant as far as picspam goes. A woman over at LiveJournal "casts" the theoi according to popular stars of the day. I don't agree with everyone. Paltrow as Athena rings false to me, but I'm hard pressed to choose an actress that could do Her justice. 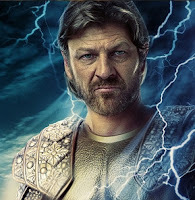 I love Hugh Laurie as Hephaestus and Sean Bean as Zeus. Her choice for Dionysus is all wrong. Oh, just go look! What do you think? Who would play your Gods in your very own Homeric movie? As much as it pains my considerable vanity to admit it, I am overweight. Not "oh, golly, I sure could stand to lost ten pounds" overweight, either. No, I'm a good 50 lbs more than the healthy weight for my frame. And I hate it. I hate that I can't do a pull-up and that I get winded walking uphill. I hate the way my clothes hang on me -- they really don't "hang" at all anymore -- and the way I look in photographs. In classical Greece a high premium was placed on physical fitness. This didn't mean starving oneself to achieve the rail-thin body type women in today's society are expected to maintain. It meant that men and women were expected to be strong, healthy, physically fit individuals. Men attended the gymnasia where they were put through rigorous training to keep them fit. They had to remain fit well into what we would consider older age in order to properly defend their city-state. In Sparta men and women were taught to wrestle from a young age. For all that the film 300 got wrong about Spartan culture, the spirit of how they portrayed youth was fairly accurate. Greeks fought in the Pankration style, which is remarkably similar to our modern Mixed Martial Arts fighting. Imagine for a moment a society in which citizens are encouraged to actively participate in philosophy, local government, and the UFC. The Greeks, very simply, were badasses. All of this makes my own weakness and general poor health seem more than laziness. I feel like I'm failing at my religious obligations. So I'm doing something about it. I've started weightlifting according to the StrongLifts 5x5 program, which uses barbell training and lots of squats. Tomorrow will be my third day on the program, or one week. I'm already feeling stronger in my core, and more than a little sore in my thighs (the squats are working!). I am not modifying my diet except to add more protein after workouts. I'm hoping to build muscle and strength and to burn body fat more effectively. In my experience cardio training just doesn't work as well as weight training for overall physical fitness. I'll be recording my fitness milestones in this blog. StrongLifts 5x5 promises to get me to a place where I'll be able to bench my ideal body weight (130lbs) and deadlift 1.5 x my ideal body weight (about 200 lbs). Right now those numbers seem impossibly high, but the program is designed to add weight in five pound increments each workout in order to train your muscles to lift heavier weight. I'm a little concerned about becoming a gym rat, one of those people who talks all the time about how much they can bench, how much time they spent at the gym, or what they weigh. I can't stand those types of people, and I promise that my blog will not become a place for that kind of self-involved rhetoric. Also, I don't judge anyone who doesn't choose to exercise. How could I? I've been a lazy lump for years, and I'm only changing my lifestyle now because I'm sick of myself. I read recently about how no one ever makes a conscious change in their life until they are "at a 10". You can be fed up for years at a 9.5 and still not be ready to change. Then one day you wake up and with a sense of peace and grace and you are ready to change. You are at a 10. My "10" moment came when I went to put on my favorite butch hipster shirt -- an awesome vintage fitted western button-down piece that my dad gave me -- and found that it was too tight to squeeze my pudgy belly into. The beautiful mother-of-pearl buttons gaped open around my distended middle. I'll never be a Pankration fighter. I'll never be a Spartan warrior, and I'll never look like Gorgo from 300 unless I starve myself. But I can be better. I can be stronger. I can be healthier. I can change for myself and for my Gods. The poets call me the gray-eyed Goddess. Sliver as the glint from a spear point. But my sight is sharper than a weapon. The scholars claim I came from a storm. Eerie dark grey-green as the most dangerous clouds. But my wisdom is more penetrating than rain. The priests say I stare like an owl. Glassy blue pupils with no whites. Able to see even in the faintest light. But my eyes are older than the darkness. Turn not away from my gaze, mortal. Rather, look me in the eyes and know the mystery. Drink of my ancient pools of wisdom. Know you the color of my eyes. Written for Noumenia, Mounukhion 1. Glaukopis is the epithet of Athena that I usually honor in my everyday worship. 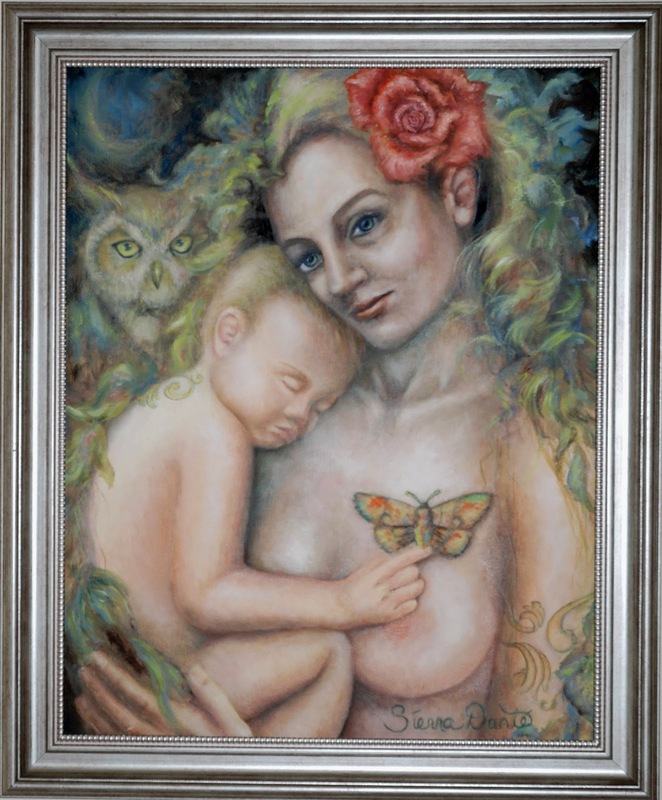 It has many translations: silver, blue-green, and gray-eyed, shining, flashing, and glinting-eyed, and, the oldest, and one of particular relevance to my own practice: owl-eyed. I have come to think of these many translations not just as an accident of an evolving language, but as a kind of mystery. Athena's eyes cannot be described completely by any one of the translations above, but encompasses all of them. I feel greatly honored to have 'seen' the color of Athena's eyes, although I will never be able to find the right words to explain them. This little hymn is my feeble attempt.